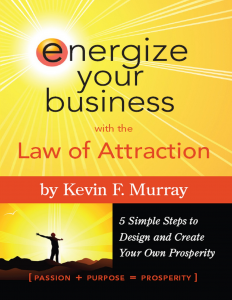 Thank you for reading (or starting) my book: Energize Your Business with the Law of Attraction. Here are the expanded exercises that go along with the book. Just click on each left hand section title below to see the additional content. Imagine being part of that AND taking your life and business to new heights of prosperity and freedom! Imagine being excited about your business. Imagine that perfect opportunities and resources flow to you all the time. Imagine that your business really works for you – versus that you really work for your business. What’s included in the OnLine content? Go ahead and click! Feel free to jump into whatever section or Step pulls you. This process, like life, is not always linear. Please sign up for our email list too, so we can keep you posted about TeleGroups, Workshops and other events where you can share your own adventure with other like-minded and like-hearted Spritual Entrepreneurs. If you have someone in your life that would enjoy this book, buy them one! To order, fill in the boxes below and you’ll go to the order page. “You are sending out energy all the time. This energy rides out on your thoughts, words, action and emotions. Sharing GOOD NEWS attracts more. Where have you been putting the energy and attention of your thought, word and action? The audio story “No Debt” can be listened to by clicking the icon under the links at the right. What are the biggest things going on in your life now? What 2 or 3 things are getting the most of your attention? What do you talk about most? What activities take up most of your day? Do you have clarity about what you desire in your life? What are your primary emotional states? Happy Agitated Joyful Angry Grateful Worried? The following exercises create new ways for you to see many aspects of your life, your world and your feelings to gain insight around what you’ve been attracting. The result of this exercise is to give you a quick graphical way to see what you have been attracting in your life. The 2nd .pdf file is the Wheel to fill in. You created all this – you can re-create yourself using the same Law of Attraction process, but now with your awareness and choice! The result of this practice is to increase awareness of your energy. This includes checking in with how you feel in your body- Physical Energy, as well as checking in emotionally- Emotional Energy. You can either do this check in with yourself at random times through the day, or if you notice yourself getting emotionally tweaked, or feeling peak, or anytime that you feel something shift, up or down; that’s a good time to check in. The result of this practice is to purposefully add things into your days and weeks, at home and at work, that build and maintain your energy. And bring balance and JOY! It’s so easy to get busy and go without things that bring us fun and lightness and renewal. Build them into your calendar. 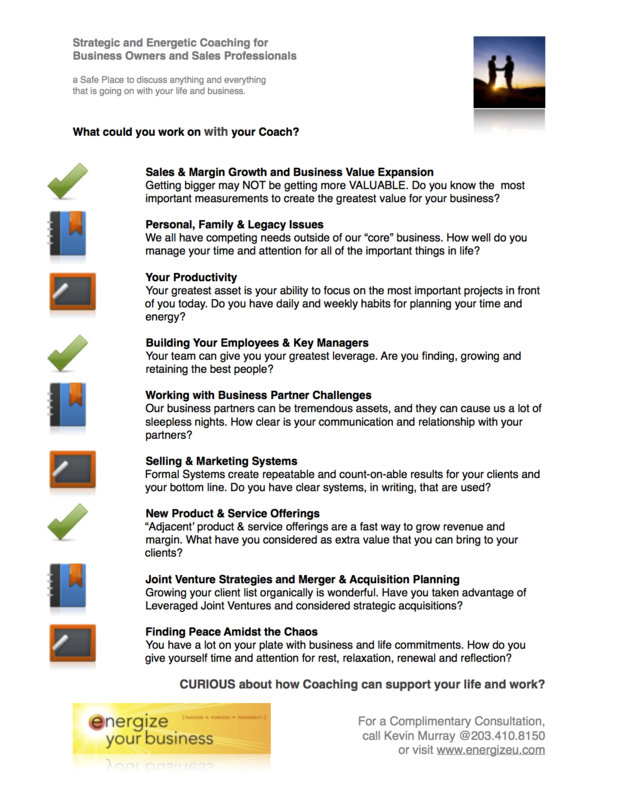 What is your business – Really? Not just at the superficial level of a quick answer. But at the level of service and the difference you and your business make in the life and work of your clients. And you want to look at the impact you get and the results you create in your own life. Give yourself some time with this exercise. You may want to put it down after you work on it a bit and revisit it every day for a few days to see what bubbles up and shifts for you. The result of this practice is to create a story – first to tell yourself, and then to share with the world. The words of this story connect you to all the benefits and feelings created when you and your clients do business. The Statement that you create will be a touchstone for you. It will light you up and inspire you. The more you revisit your statement and read it and feel it, the more magnetizing energy you send out. Your words attract to you the desires that are contained in the Statement. This is the Journaling exercise that goes along with the meditation. According to the Law of Attraction, the Universe will comply with that request. The only problem is that we’ll get all kinds of clients, not necessarily the ones we really want. Life and business get much simpler and happier when your clients are the kind you prefer. Why shouldn’t you get to pick your clients? Why have clients that don’t appreciate you and that you don’t love working with? Imagine if all of your business energy was reserved for Ideal Clients only. After you complete this exercise, you may want to connect with other Spiritual Entrepreneurs or go a little deeper on a TeleGroup or TeleClass, or at a WorkShop or you can explore what you discovered and how to take it into action with me in a One-on-One session. The result of this practice is to create extreme clarity of the Ideal Clients that we want to attract to our business. The first download on the right is the exercise description and the second download is the Ideal Client Matrix to be used for this exercise. The differences between a business with formal, clearly defined systems and a business without them are stark. Whether you are a client, employee, vendor, or the boss; having clearly written systems will make a tremendous difference in the relationship between energy-in and results-out. As a business owner, the difference is between doing the same job day in and day out, versus creating free time and extra resources for you to invest in your life. Now, whether you invest your time and money back in your business or in time for yourself or with those you care for; that’s up to you! The first thing to understand is that all businesses have lots and lots of systems. Your system for filing may be to let mail pile up until it falls off your desk, and then move it into the pile called “things that have fallen off my desk” etc. That is a system. And like all systems, it will have an impact on the people that work there (especially you) and everyone who comes into contact with that organization.